Toronto has had a Black population from its earliest days as a settlement. Black groups have included United Empire Loyalists, Americans escaping enslavement, rural Canadians moving from Nova Scotia or southwestern Ontario, Jamaicans following economic opportunities, and Somalis and Ghanaians establishing themselves in a new land. Each individual and each community has contributed to the growth of Toronto as a unique city. Finding documentary evidence of the Black population in the City Archives can be a challenge, particularly from the early years. Here are a few samples from a history that is still being uncovered. 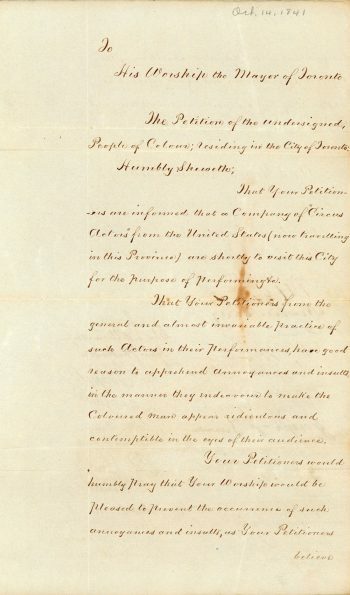 That your Petitioners are informed that a Company of “Circus Actors” from the United States (now travelling in this Province) are shortly to visit this City for the purpose of performing &c.
That Your Petitioners from the general and almost invariable practice of such Actors in their performances, have good reason to apprehend annoyances and insults, in the manner they endeavour to make the Coloured man appear ridiculous and contemptible in the eyes of their audience. 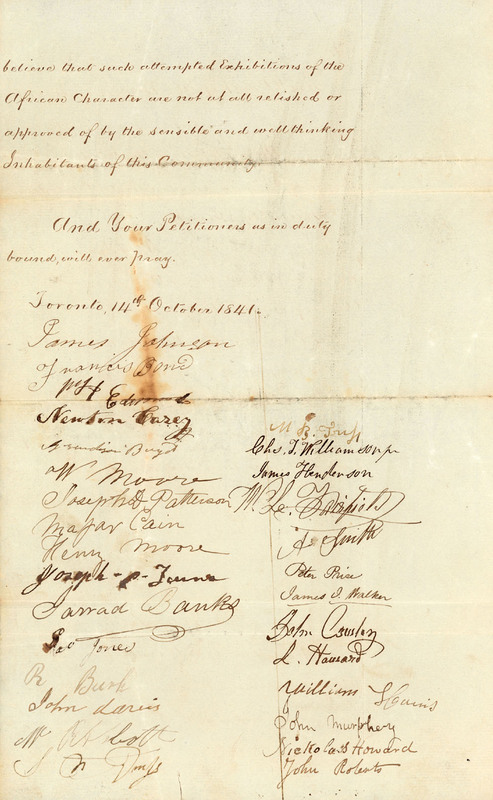 Your Petitioners would humbly pray that Your Worship would be pleased to prevent the occurrence of such annoyances and insults, as Your Petitioners believe that such attempted Exhibitions of the African Character are not at all relished or approved of by the sensible and well thinking Inhabitants of this Community.